With Maxol at the heart of Spraoi again this year, three days of some of the best big bands will perform on the Maxol Music Stage at John Roberts Square, located in the heart of the city’s busy shopping area. Spraoi 2016 - Music and Arts Festival in Waterford offers a great summer cocktail of live music, street activity and performances from around the world between 29th-31st July. The programme of the Music Stage will be released on 24th June on www.spraoi.com. All music events will be free of charge with gigs held at indoor and outdoor locations. 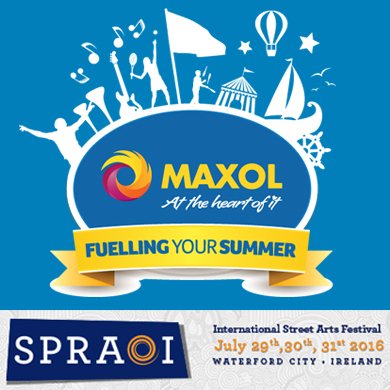 Details of Maxol’s great Spraoi festival prizes will be announced soon. Fuelling Your Summer. Maxol, at the heart of it!